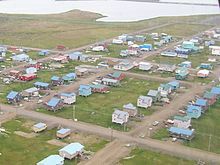 Utqiagvik, (Inupiaq: Utqiaġvik, IPA: [utqe.ɑʁvik], English: /ˌʊtkiˈɑːvɪk/ UUT-kee-AH-vik), officially the City of Utqiaġvik,[A] and previously Barrow (/ˈbæroʊ/) is the largest city and the borough seat of the North Slope Borough in the U.S. state of Alaska and is located north of the Arctic Circle. 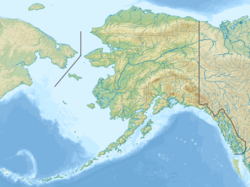 It is one of the northernmost public communities in the world and is the northernmost city in the United States. Nearby Point Barrow is the country's northernmost point. Utqiagvik's population was 4,581 at the 2000 census and 4,212 at the 2010 census. 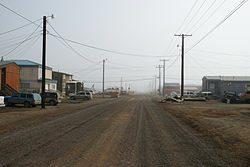 Street view of Utqiagvik in July 2008. This street, like all the others in Utqiagvik, has been left unpaved due to the prevalence of permafrost. The location has been home to the Iñupiat, an indigenous Inuit ethnic group, for more than 1,500 years. The city's native name, Utqiaġvik, refers to a place for gathering wild roots. It is derived from the Iñupiat word utqiq, also used for "potato". The name was first recorded in 1853 as "Ot-ki-a-wing" by Commander Rochfort Maguire, Royal Navy. John Simpson's native map dated 1855, records the name "Otkiawik," which was misprinted on the subsequent British Admiralty Chart as "Otkiovik." The name Barrow was derived from Point Barrow, and was originally a general designation, because non-native Alaskan residents found it easier to pronounce than the Inupiat name. A post office established in 1901 helped the name "Barrow" to become dominant. Point Barrow was named after Sir John Barrow of the British Admiralty by explorer Frederick William Beechey in 1825. In an October 2016 referendum, city voters narrowly approved to change its name from Barrow to its traditional Iñupiaq name, Utqiaġvik. The governor had 45 days to rule on the name change and it was officially adopted on December 1, 2016. City Council member Qaiyaan Harcharek described the name change as supporting use of the Iñupiaq language and being part of a process of "decolonization". Another recorded Iñupiaq name is Ukpiaġvik (/ukpiɔʁvik/), which comes from ukpik "snowy owl" and translates to "the place where snowy owls are hunted". A spelling variant of this name was adopted by the Ukpeaġvik Iñupiat Corporation when it was established in 1973. Archaeological sites in the area indicate the Iñupiat lived around Utqiagvik as far back as AD 500. Remains of 16 sod dwelling mounds, from the Birnirk culture of about AD 800, can be seen on the shore of the Arctic Ocean. Located on a slight rise above the high-water mark, they are at risk of being lost to erosion. Barrow, like most communities in Alaska, looks temporary, like a pioneer settlement. It is not. Barrow is among the oldest permanent settlements in the United States. Hundreds of years before the European Arctic explorers showed up... Barrow was more or less where it is now, a natural hunting place at the base of a peninsula that pokes out into the Beaufort Sea. ... Yankee whalers sailed here, learning about the bowhead whale from Iñupiat hunters ... Later, the military came, setting up a radar station, and in 1947 a science center was founded at Barrow. British Royal Navy officers came to the area to explore and map the Arctic coastline of North America. The US acquired Alaska in 1867. The United States Army established a meteorological and magnetic research station at Utqiagvik in 1881. In 1888, a Presbyterian church was built by United States missionaries at Utqiagvik. The church is still used today. In 1889 a whaling supply and rescue station was built. It is the oldest wood-frame building in Utqiagvik and is listed on the National Register of Historic Places. The rescue station was converted for use in 1896 as the retail Cape Smythe Whaling and Trading Station. In the late 20th century, the building was used as Brower's Cafe. In 1901, a United States Post Office was opened. In 1935, the famous humorist Will Rogers and pilot Wiley Post made an unplanned stop at Walakpa Bay 15 mi (24 km) south of Utqiagvik, en route to the city. As they took off again, their plane stalled and plunged into a river, killing them both. Two memorials have been erected at the location, now called the Rogers-Post Site. 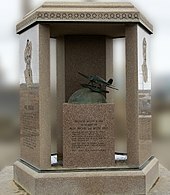 Another memorial is located in Utqiagvik, where the airport was renamed as the Wiley Post–Will Rogers Memorial Airport in their honor. In 1940, the indigenous Iñupiat organized as the Native Village of Barrow Iñupiat Traditional Government (previously, Native Village of Barrow), which is a federally recognized Alaska Native Iñupiat "tribal entity", as listed by the US Bureau of Indian Affairs circa 2003. They wrote a constitution and by-laws, under the provisions of the Indian Reorganization Act (IRA) of 1934. An IRA corporation was also created. Utqiagvik was incorporated as a 1st Class City under the name Barrow in 1958. Residents of the North Slope were the only Native people to vote on acceptance of the Alaska Native Claims Settlement Act; they rejected it. The Act was passed in December 1971 and, despite their opposition, became law. The Ukpeaġvik Iñupiat Corporation (UIC) is the for-profit village corporation established under the Act. In 1972, the North Slope Borough was established. With millions of dollars in new revenues from the settlement and later oil revenues, the borough has created sanitation facilities, water and electrical utilities, roads, fire departments, and health and educational services in Utqiagvik and the villages of the North Slope. In 1986, the North Slope Borough created the North Slope Higher Education Center. Renamed Iḷisaġvik College, it is an accredited two-year college providing education based on the Iñupiat culture and the needs of the North Slope Borough. The Tuzzy Consortium Library, in the Iñupiat Heritage Center, serves the communities of the North Slope Borough and functions as the academic library for Iḷisaġvik College. The library was named after Evelyn Tuzroyluk Higbee, an important leader in the community. Utqiagvik, like many communities in Alaska, has enacted a "damp" law, prohibiting the sale of alcoholic beverages. It allows for import, possession and consumption of such beverages. In 1988, Utqiagvik became the center of worldwide media attention when three California gray whales became trapped in the ice offshore. After a two-week rescue effort (Operation Breakthrough), a Soviet icebreaker freed two of the whales. Journalist Tom Rose details the rescue, and the media frenzy that accompanied it, in his 1989 book Freeing The Whales. The movie Big Miracle is based on the rescue and was released on February 3, 2012. In October 2016, a city referendum renamed the city from Barrow to its traditional Iñupiaq name, Utqiaġvik. The name change officially went into effect on December 1, 2016. Utqiagvik is roughly 1,300 miles (2,100 km) south of the North Pole. Only 2.6% of the Earth's surface lies as far and farther from the equator as Utqiagvik. According to the United States Census Bureau, the city has a total area of 21 sq mi (54 km2), 18 sq mi (47 km2) of the area being land and 3 sq mi (8 km2) being water. Water makes up 14% of the total area. The predominant land type in Utqiagvik is tundra, which is formed over a permafrost layer that is as much as 1,300 feet (400 m) in depth. Utqiagvik is surrounded by the National Petroleum Reserve–Alaska. The city of Utqiagvik has three sections, which can be classified as south, central, and north, and are known to residents as Utqiagvik, Browerville, and NARL, respectively. The southernmost of the sections, known historically as the "Barrow side", is the oldest and second-largest of the three; it serves as downtown. This area includes Wiley Post-Will Rogers Memorial Airport, Barrow High School, North Slope Borough School District, Fred Ipalook Elementary School, as well as restaurants, hotels, the police station, the Utqiaġvik City Hall, a Wells Fargo bank, and numerous houses. The Central section is the largest of the three, and is called Browerville. This has traditionally been a residential area for the City of Utqiaġvik, but in recent years many businesses have opened or moved to this area. Browerville is separated from the south section by a series of lagoons, with two connecting dirt roads. This area, in addition to the houses, includes Tuzzy Consortium Library, the US Post Office, Eben Hopson Middle School, Samuel Simmonds Memorial Hospital, the Iñupiat Heritage Center, two grocery stores, one hotel and two restaurants. The north section is the smallest and most isolated of the three sections, known to the residents as NARL because it was originally the site of the Naval Arctic Research Lab. It is connected to the central section only by Stevenson Street, a two-lane dirt road. The NARL facility was transferred by the federal government to the North Slope Borough, which adapted it for use as Iḷisaġvik College. This area also includes a small broadcasting station, which is run by the college students. An ancient 5.0 mi (8 km)-sized crater, Avak, is situated near Utqiagvik. Owing to its location 320 miles (515 km) north of the Arctic Circle, Utqiagvik's climate is cold and dry, classified as a polar climate (Köppen ET). Winter weather can be extremely dangerous because of the combination of cold and wind, while summers are cool even at their warmest. Weather observations are available for Utqiagvik dating back to the late 19th century. A National Oceanic and Atmospheric Administration (NOAA) Climate Monitoring Lab operates in Utqiagvik. The United States Department of Energy (DOE) has a climate observation site in Utqiagvik as part of its Atmospheric Radiation Measurement (ARM) Climate Research Facility. Despite the extreme northern location, temperatures at Utqiagvik are moderated by the surrounding topography. The Arctic Ocean is on three sides, and flat tundra stretches some 200 miles (300 km) to the south. There are no wind barriers or protected valleys where dense cold air can settle or form temperature inversions in the lower atmosphere, as commonly happens in the interior between the Brooks and the Alaska ranges. Utqiagvik has the lowest average temperatures of cities in Alaska. Although it is rare for Utqiagvik to record the lowest temperatures statewide during cold waves, extremely low wind chill and "white out" conditions from blowing snow are very common. Temperatures remain below freezing from early October through late May. The high temperature is above freezing on an average of only 120 days per year, and there are 160 days of sub-0 °F (−18 °C). Freezing temperatures and snowfall can occur during any month of the year. In terms of precipitation, Utqiagvik has a desert climate, and averages less than 5 inches (127 mm) "rainfall equivalent" per year. One inch of rain possesses approximately equal water content to 12 inches (30 cm) of snow. According to 1971−2000 normals, this includes 29 inches (74 cm) of snow,  compared to 101 inches (257 cm) for Kuujjuaq in Nunavik, Quebec or 84 inches (213 cm) and 77 inches (196 cm) for much warmer Juneau and Kodiak, Alaska, respectively. 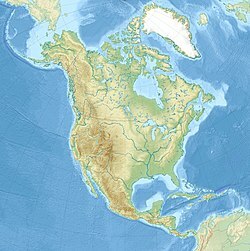 Even Sable Island, at around 44 degrees latitude and under the influence of the Gulf Stream, receives 44 inches (112 cm), or 52 percent more snowfall than Utqiagvik. The first snow (defined as snow that will not melt until next spring) generally falls during the first week of October, when temperatures cease to rise above freezing during the day. October is usually the month with the heaviest snowfall, with measurable amounts occurring on nearly half the days and an average total accumulation of 8.8 inches (22 cm). The sun sets on November 18 or 19, and it remains below the horizon for about 66 days. This creates a polar night that lasts until the Sun returns to lightly touch the horizon (due to the refraction and scattering of the atmosphere) by January 22 or January 23. The sun then rises again completely over the horizon by January 27 or 28. During the first half of the polar night, there is a decreasing amount of twilight each day, and on the winter solstice (around December 21 or December 22), civil twilight in Utqiagvik lasts for a mere 3 hours. In addition to its low temperatures and polar night, Utqiagvik is one of the cloudiest places on Earth. Owing to the prevailing easterly winds off the Arctic Ocean, Utqiagvik is completely overcast slightly more than 50% of the year. It is at least 70% overcast some 62% of the time. Cloud types are mainly low stratus and fog; cumuli forms are rare. Peak cloudiness occurs in August and September when the ocean is ice-free. Dense fog occurs an average of 65 days per year, mostly in the summer months. Ice fog is very common during the winter months, especially when the temperature drops below −30 °F (−34 °C). Serious cold weather usually begins in January, and February is generally the coldest month, averaging −14.2 °F (−25.7 °C). By March 1, the sun is up for 9 hours, and temperatures begin to warm, though winds are usually higher. April brings less extreme temperatures, with an average of 1.8 °F (−16.8 °C), and on April 1 the sun is up for more than 14 hours. In May, the temperatures are much warmer, averaging 21.2 °F (−6.0 °C). Beginning around May 11 or 12, the sun remains above the horizon the entire day, and the phenomenon known as the midnight sun is observed. The sun does not set for about 80 days, until around July 31 or August 1. In June, the average temperature rises above freezing, to 35.7 °F (2.1 °C), and average daily temperatures remain above freezing until mid- or late September. July is the warmest month of the year, with an average high of 47 °F (8 °C) and an average low temperature of 35 °F (2 °C). Beginning in late July, the Arctic Ocean is relatively ice-free, and remains so until late October. The highest temperature recorded in Utqiagvik was 79 °F (26 °C) on July 13, 1993, while the lowest is −56 °F (−49 °C) on February 3, 1924; the highest minimum is 53 °F (12 °C), while the lowest maximum is −47 °F (−44 °C). Utqiagvik records an average 24 days per year where the high reaches at least 50 °F (10 °C). Even in July and August, the low falls to or below the freezing mark on 24 days. Variation of wind speed during the year is limited, with the fall months being windiest. Extreme winds from 40 to 60 miles per hour (60 to 100 km/h) have been recorded for all months. Winds average 12 mph (20 km/h) and are typically from the east. The City of Utqiaġvik first appeared on the 1880 U.S. Census as the unincorporated Inuit village of "Ootiwakh." 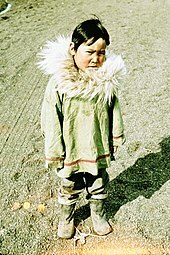 All 225 of its residents were Inuit. In 1890, the community and area was returned as the "Cape Smythe Settlements", which was including the refuge & whaling stations, Pengnok, Utkeavie, Kugaru (Inaru) River villages, 4 other camps & Whaling Steamer Balaena. Of those 246 residents, 189 were natives, 46 were White, 1 was Asian and 10 were other races. This did not include nearby Point Barrow, which was a separate community. In 1900, it reported again as "Cape Smythe Settlements." In 1910, it first reported as Barrow, and in every successive census to 2010. It formally incorporated in 1959. The native name of Utqiaġvik was adopted in 2016 and will appear on the 2020 census. As of the 2010 United States Census, there were 4,212 people residing in the city. The racial makeup of the city was 60.5% Alaskan Native, 16.2% Caucasian, 0.9% African, 8.9% Asian, 2.3% Pacific Islander and 8.1% from two or more races. 3.1% were Hispanic or Latino of any race. As of the census of 2000, there were 4,683 people, 1,399 households, and 976 families residing in the city. The population density was 249.0 people per square mile (96.1/km2). There were 1,620 housing units at an average density of 88.1 per square mile (34.0/km2). The racial makeup of the city is 57.19% Alaska Native, 21.83% White, 9.41% Asian, 1.00% Black or African American, 1.35% Pacific Islander, 0.70% from other races, and 8.51% from two or more races. Hispanics or Latinos of any race were 3.34% of the population. There were 1,399 households out of which 56.5% had children under the age of 18 living with them, 45.2% were married couples living together, 14.8% had a female householder with no husband present, and 28.0% were non-families. 23.0% of all households were made up of individuals and 1.8% had someone living alone who was 65 years of age or older. The average household size was 3.35 and the average family size was 4.80. In Utqiagvik, the age distribution shows 27.7% under the age of 18, 13.3% from 18 to 24, 31.6% from 25 to 44, 19.4% from 45 to 64, and 3.4% who were 65 years of age or older. The median age was 29 years. For every 100 females, there were 107.1 males. For every 100 females age 18 and over, there were 109.5 males. The median income for a household in the city was $63,094.09, and the median income for a family was $68,223. Males had a median income of $51,959 versus $46,382 for females. The per capita income for the city was $22,902. About 7.7% of families and 8.6% of the population were below the poverty line, including 7.2% of those under the age of 18 and 13.12% of those 65 and older. As of March 3, 2009, the town's website wrote of the population: "The largest city in the North Slope Borough, Utqiagvik has 4,429 residents, of which approximately 61% are Iñupiat Eskimo." Utqiagvik is the economic center of the North Slope Borough, the city's primary employer. Numerous businesses provide support services to oil field operations. State and federal agencies are employers. The midnight sun has attracted tourism, and arts and crafts provide some cash income. Because transporting food to the city is very expensive, many residents continue to rely upon subsistence food sources. Whale, seal, polar bear, walrus, waterfowl, caribou, and fish are harvested from the coast or nearby rivers and lakes. Utqiagvik is the headquarters of the Arctic Slope Regional Corporation, one of the Alaska Native corporations set up following the Alaska Native Claims Settlement Act in 1971 to manage revenues and invest in development for their people in the region. Kivgiq, The Messenger Feast. In more recent times this has been held almost every year, but "officially" is held every two or three years in late January or early February. It is called at the discretion of the North Slope Borough Mayor. Kivgiq is an international event which attracts visitors from around the Arctic Circle. Piuraagiaqta, The Spring Festival. This celebrates breaking a path in the ice for boats to hunt whales. Held in mid-April and includes many outdoor activities. 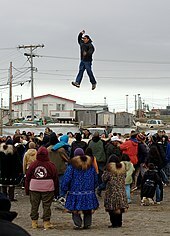 Nalukataq, The Blanket Toss Celebration. Held on multiple days beginning in the third week of June to celebrate each successful spring whale hunt. July 4, Independence Day. In Utqiagvik, this is time for Eskimo games, such as the two-foot high kick and ear pull, with the winners going on to compete at the World Eskimo Indian Olympics. Whaling. Generally happens during the second week of October. Qitik, Eskimo Games. Also known as Christmas Games, these are held from December 26 through January 1. Utqiagvik (then called Barrow) is the setting for a series of horror comic books titled 30 Days of Night. The stories center on vampires who take advantage of month-long annual polar night in the town to openly kill and feed at will, massacring most of the townspeople. A commercially successful film, named after and based upon the comic, was released on October 19, 2007, followed by a straight-to-video sequel on July 23, 2010. Karl Pilkington is sent to Utqiagvik (then called Barrow) in the second season of An Idiot Abroad. On the Ice, a film released in 2011 about teenagers dealing with a tragic accidental death, was filmed entirely in Utqiagvik with locals acting in most roles. Big Miracle, a 2012 film starring Drew Barrymore, is based on the true story of whales trapped under ice near Point Barrow, and features scenes in and characters from Utqiagvik (then called Barrow). The Agents of S.H.I.E.L.D. episode "T.R.A.C.K.S." has Phil Coulson threaten Ward with a transfer to Utqiagvik (then called Barrow) to guard Emil Blonsky's cryo-cell. Stephen Fry visited the town and its people during the last segment of his documentary Stephen Fry in America. In 2015, the NFL Network began an 8-part documentary series focusing on the Barrow High School Whalers football team. On August 19, 2006, the Whalers of Barrow High School played the first official football game in the Arctic against Delta Junction High School. Barrow High School recorded its first win two weeks later; the coaches and players celebrated the historic win by jumping into the Arctic Ocean, just 100 yd (91 m) from the makeshift dirt field. 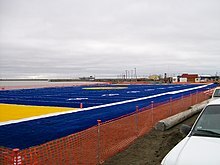 On August 17, 2007, the Whalers football team played their first game of the season on their new artificial-turf field. The historic game, attended by former Miami Dolphins player Larry Csonka, was the first live Internet broadcast of a sporting event in the United States from north of the Arctic Circle. Since the team's formation, it has gathered a record of 33-24, and most recently, the team reached the semi-final round of the Alaskan State Small School Football Championship. In 2017, The Barrow High School Football team recorded their first ever state championship win over the Homer Mariners 20-14. Ben Heather lead the team to victory with 134 rushing yards and 2 touchdowns with the help of an unstoppable line and defensive prowess led by Sebastian Sias. The support of Sione Tuifua, Travis Adams, Calvin Miller, and Remese Unutoa also helped The Whalers to clinch their first ever 3A small schools state champion. In 2015, the Barrow High School boys' basketball team won the Alaska Class 3A State Championship with a 50-40 victory over two-time defending state champion, Monroe Catholic. The Whalers' team was led by 5-star recruit Kamaka Hepa. As a 6'7" freshman he was regarded as one of the top basketball recruits in the country. He was ranked as the #21 ranked basketball recruit in the country by ESPN for the class of 2018. Hepa transferred to Jefferson High School in Portland, Oregon, for his junior year. By October 2017, at 6'8" tall, he had committed to go to the University of Texas. The Whalers' boys' basketball team finished the 2014-2015 season with a 24-3 record, the highest win percentage in school history. Guard Travis Adams was a standout as well. Coach Jeremy Arnhart's teams won 186 games in 10 seasons. Also in 2015, the Barrow High School girls' team easily won the ACS tournament. Utqiagvik is served by the North Slope Borough School District. The schools serving the city are Ipalook Elementary School, Hopson Middle School, and Barrow High School. Iḷisaġvik College, a two-year tribal college, is located in Utqiagvik. The front entrance of the KBRW studios. KBRW (AM)/KBRW-FM radio station broadcasts in Utqiagvik on 680 kHz AM and 91.9 MHz FM. KBRW is also broadcast via FM repeaters in all of the North Slope Borough villages, from Kaktovik to Point Hope. The Arctic Sounder is a newspaper published weekly by Alaska Media, LLC, which covers news of interest to the North Slope Borough, which includes Utqiagvik, and the Northwest Arctic Borough, which includes Kotzebue, in northwestern Alaska. Appeared in Channel 4 from Alaska Rural Communications Service. The stations are K04KS and K11NN. 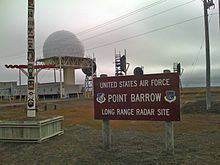 Sign and facilities of the Point Barrow Long Range Radar Site. Alaska Airlines 737-400 combi aircraft at Post–Rogers Airport in December 2007. Note that it is twilight; the sun does not rise in December, but gets close enough to the horizon to illuminate. The roads in Utqiagvik are unpaved due to the permafrost, and no roads connect the city to the rest of Alaska. 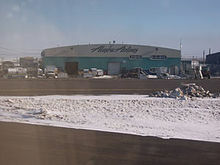 Utqiagvik is served by Alaska Airlines with passenger jet service at the Wiley Post–Will Rogers Memorial Airport from Anchorage and Fairbanks. New service between Fairbanks and Anchorage began from Era Aviation on June 1, 2009. Freight arrives by air cargo year round and by ocean-going marine barges during the annual summer sealift. Utqiagvik is the transportation hub for the North Slope Borough's Arctic coastal villages. Multiple jet aircraft, with service from Deadhorse (Prudhoe Bay), Fairbanks and Anchorage, provide daily mail, cargo, and passenger services, which connect with smaller single- and twin-engine general aviation aircraft that provide regular service to other villages, from Kaktovik in the east to Point Hope in the west. The town is also served by several radio taxi services, most using small four-wheel drive vehicles. Samuel Simmonds Memorial Hospital, located in the City of Utqiaġvik, is the primary healthcare facility for the North Slope region of Alaska. Individuals in need of medical care in the Utqiagvik are able to access the hospital by road. However, because no roads lead in or out of Utqiagvik, individuals in surrounding communities and towns (such as Point Hope, Prudhoe Bay, and Wainwright) must be airlifted in by plane, helicopter, or air ambulance. The hospital underwent construction and was relocated across the city in 2013. It is now nearly four times larger than it was before. The facility operates 24 hours a day, 7 days a week, and is the northernmost hospital/medical facility in the United States. ^ The official name is the "City of Utqiaġvik", spelled with the diacritical mark on the "g". ^ a b c d Geographic Names Information System (GNIS) details for Utqiagvik, Alaska; United States Geological Survey (USGS); January 1, 2000. ^ "Directory of Borough and City Officials 1974". Alaska Local Government. XIII (2): 20. January 1974. ^ United States Postal Service (2016). "USPS - Look Up a ZIP Code". Retrieved 2016-11-03. Only "Barrow AK 99723" is accepted by the U.S. Postal Service for addresses in Utqiaġvik. ^ Demer, Lisa (29 October 2016). "Barrow's new name is its old one, Utqiaġvik. Local Iñupiaq leaders hope its use heals as it teaches". Anchorage Daily News. Retrieved 18 December 2017. ^ Demer, Lisa (2016-10-29). "Barrow's new name is its old one, Utqiaġvik. Local Iñupiaq leaders hope its use heals as it teaches." Alaska Dispatch News. ^ (Great Britain, 1854, map facing p. 186). ^ "Barrow voters support name change to 'Utqiagvik'". Alaska Dispatch News. Retrieved 14 October 2016. ^ Mackintosh, Cameron. "Barrow voters narrowly approve ordinance to rename city". KTUU. Retrieved 14 October 2016. ^ "Alaskan City Votes to Take Traditional Iñupiat Eskimo Name". The Guardian. Associated Press. 16 October 2016. Retrieved 16 October 2016. ^ "Barrow, Alaska, Changes Its Name Back To Its Original 'Utqiagvik'". NPR.org. Retrieved 2016-12-02. ^ Streever, Bill (2009). Cold: Adventures in the World's Frozen Places. New York: Little, Brown and Company. pp. 154–155. ^ "Barrow Arctic Research Center/ Environmental Observatory: History and Facilities". Barrow Arctic Research Center/ Environmental Observatory. Retrieved 20 February 2019. ^ a b c "State of Alaska Community Database Online". Dced.state.ak.us. Archived from the original on 2013-01-06. Retrieved 2015-10-28. ^ Rose, TOM. "Freeing The Whales - How the Media Created the World's Greatest Non-Event". Archived from the original on 21 January 2010. Retrieved 7 January 2010. ^ Dent, Mark (May 7, 2009). "May 7: Barrow whale rescue movie…". Anchorage Daily News. Archived from the original on 10 May 2009. Retrieved 7 January 2010. ^ "Everybody Loves Whales". IMDb.com. Retrieved 2015-10-28. ^ "Technology status assessment" (PDF). Netl.doe.gov. ^ "Iñupiat Heritage Center". US National Park Service. 2015-01-05. Retrieved 2015-10-28. ^ a b "Home". Cityofbarrow.org. 2015-04-03. Retrieved 2015-10-28. ^ a b c "Summary about Barrow NWS Station". Climate.gi.alaska.edu. Archived from the original on 2013-01-19. Retrieved 2015-10-28. ^ a b c d e f g "NOWData - NOAA Online Weather Data". National Oceanic and Atmospheric Administration. Retrieved 2017-08-28. ^ a b "Coastal Pilot 9, 25th Edition, 2007" (PDF). "NOAA". Archived from the original (PDF) on 2008-02-29. ^ "Canadian Climate Normals 1971-2000 Station Data". Climate.weatheroffice.gc.ca. 2015-09-22. Retrieved 2015-10-28. ^ a b "Daylight and darkness". Alaska.com. Retrieved 2015-10-28. ^ Maykut, Gary A.; Church, Phil E. (1973). Journal of Applied Meteorology. Department of Atmospheric Sciences, University of Washington. pp. 620–621. ^ "Station Name: AK BARROW POST ROGERS AP". National Oceanic and Atmospheric Administration. Retrieved 2016-09-11. ^ "WMO Climate Normals for BARROW/W. POST W. ROGERS, AK 1961–1990". National Oceanic and Atmospheric Administration. Retrieved 2016-09-27. ^ "Census of Population And Housing". U.S. Census Bureau. Archived from the original on 2013-10-01. Retrieved 2011-04-20. ^ "2010 Census". U.S. Census Bureau. Retrieved 2011-07-07. ^ "Geological Survey Professional Paper". 1949. ^ "American FactFinder". United States Census Bureau. Archived from the original on 2017-01-08. Retrieved 2008-01-31. ^ a b "State of Alaska Community Database". dced.state.ak.us. Archived from the original on 2013-06-29. Retrieved 2015-10-28. ^ "Pottsville news, sports, obituaries, and shopping | republicanherald.com". Republican Herald. Retrieved 2015-10-28. ^ "Alaska high school football programs with the most wins since 2008". MaxPreps. 2013-05-16. Retrieved 2015-10-28. ^ "Kamaka Hepa - Basketball Recruiting - Player Profiles - ESPN". ^ "ESPN Basketball Recruiting - Super 60 Player Rankings". ^ Kamaka Hepa, Jefferson 4-star PF, commits to Texas Longhorns, Oregon Live, October 31, 2017. Retrieved December 16, 2017. ^ Basketball fans come to watch Hepa, but leave talking about Adams as well, ASAA365, Van Williams, March 23, 2016. Retrieved 20 November 2016. ^ ACS boys, Barrow girls capture basketball titles, Alaska Dispatch News, January 15, 2015. Retrieved 20 November 2016. ^ "AM/FM Silakkuagvik Communications - "Top of the World Radio"KBRW – AM/FM Silakkuagvik Communications | "Top of the World Radio"". KBRW. Retrieved 2015-10-28. ^ "Barrow, Alaska". astresystems.com. Archived from the original on 2006-02-05. Retrieved 2013-09-10. ^ "About Barrow". Archived from the original on 2011-07-25. Retrieved 2017-02-06. ^ "Samuel Simmonds Memorial Hospital". Arctic Slope Regional Corporation. Retrieved October 28, 2015. Dekin, Jr., Albert A. (June 1987). "Sealed in Time". National Geographic. Vol. 171 no. 6. pp. 824–836. ISSN 0027-9358. OCLC 643483454. 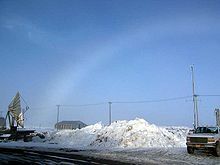 Wikimedia Commons has media related to Utqiagvik, Alaska. 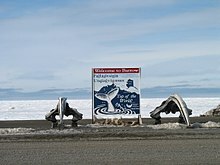 Wikivoyage has a travel guide for Utqiagvik.